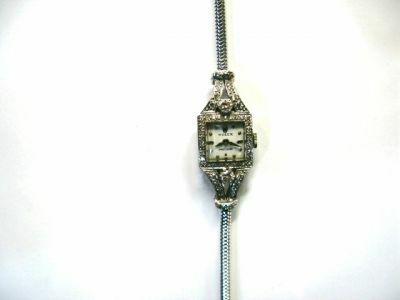 Vintage Art Deco Ladies 18kt white gold Rolex manual wind wristwatch, featuring 2 claw-set round brilliant cut diamonds, est. 0.24ct. (clarity: VS & colour: G) and 54 bead-set single cut diamonds, est. 0.45ct. (clarity: VS & colour: G-H). The watch has a square dial with dot numerals and baton numerals at 3, 6 and 9 o'clock. It has the Rolex Coronet at 12 o'clock. The bracelet is approx. 6.5" (16.51cm) long.